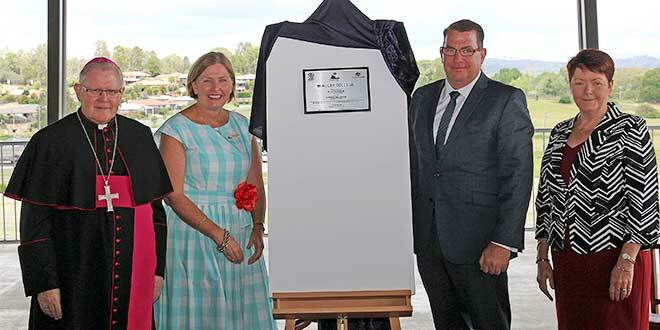 New era: Archbishop Mark Coleridge, foundation principal Deidre Young, Federal Member for Wright Scott Buchholz and Brisbane Catholic Education executive director Pam Betts unveil a plaque at the official opening of McAuley College. FOUNDATION staff and students welcomed special guests to McAuley College for the blessing and official opening of the Scenic Rim’s first Catholic secondary school. Situated within Oakland Estate in Beaudesert, the college welcomed its first cohort of Year 7 students at the beginning of the school year. Stage 1 of construction included Year 7 and 8 classrooms, a sports oval, a library and administration block, a multi-purpose undercover area, toilets, change rooms, and a specialist block. McAuley College was expected to gradually grow each year, eventually accommodating about 800 students and 60 full-time staff. 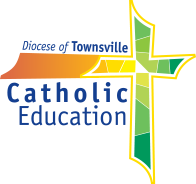 Archbishop Mark Coleridge joined Brisbane Catholic Education executive director Pam Betts, representatives of the Sisters of Mercy and special guests for the long-anticipated blessing and official opening ceremony. Archbishop Coleridge led a liturgy before blessing some items associated with the college. He told those gathered that it was at the college the young would learn the art of being human. “Here we say Jesus will teach the young what it really means to be a human being with a heart of flesh and not a heart of stone,” he said. Miss Betts said the long-awaited ceremony marked a dream becoming reality. She said it was the parents, school leaders, priests and members of the parish who had a wonderful dream for the education of secondary students in Beaudesert. “The dream of those early planners is certainly coming to its realisation,” she said. Miss Betts said it was important to dream. “As parents and teachers, we have great dreams and hopes for the students of McAuley College,” she said. “As I look around this morning I remember the day last year when the first sods of soil were turned to begin the project which has become McAuley College. The college also continued another inspiring story, that of the Sisters of Mercy, who had been a presence in Beaudesert for more than a century, opening primary schools in Beaudesert and Boonah. In naming the college after the founder of the Mercy Sisters Catherine McAuley, their presence would continue to inspire and guide. Foundation student Caitlin Moore said she was delighted to be involved in the blessing and opening ceremony. She said she was very happy to be able to attend a Catholic college close to her home. “I like having the opportunity to be able to participate in religious events through our college,” she said. Foundation deputy principal Michael Darcy said the ceremony was the culmination of a lot of hard work by many people involved with the newly established college.